Barbecue sauces come in various flavors, colors, and types. These 10 barbecue sauce recipes represent all the different approaches to the classic, thick sauce you will find in restaurants and stores around the world. There are subtle differences in all the regions of barbecue, and these represent them all. From ribs to brisket to burgers and whatever else you can imagine putting a barbecue sauce on, one of these will be your favorite. St. Louis Style Barbecue Sauces are thinner and tangier than those served in Kansas City. St. Louis is at the crossroads of barbecue and has many influences. There is a variety of way of preparing this style of barbecue sauce, but this one has the perfect combination of flavors that make St. Louis Barbecue. Traditionally, Memphis Barbecue is served without sauce, but since there are no real rules in barbecue, several Memphis BBQ Joints have sauces available, either on the side or by special order. This sauce captures the flavors of Memphis Barbecue in a fantastic sauce that has both sweet and vinegar and a hint of heat. Kansas City sauces are the most popular on the market. This one, so much better than bottled, has all the thick richness you want in a great barbecue sauce. The perfect combination of tangy sweetness works with everything it goes on, and you can kick up the heat if you want. This is the classic, sticky-sweet barbecue sauce. In Eastern Texas, barbecue is a melting of flavors from around the world. This is a classic, thick and rich sauce that starts with ketchup and build from there. This is a sauce that combines so many flavors. Take the time to let it blend to perfection, and it will be the kind of barbecue sauce you keep on hand to top almost everything. The barbecue sauces of the deep South have a tangy flavor that makes them pop out on anything they are added to. While this tomato and vinegar based sauce is perfect for pork, it goes well with everything and has a distinctive flavor that will have everyone asking for more. Char Sui is the classic Chinese Barbecue Sauce. Perfect on ribs, this one has none of the typical ingredients but is sticky with a touch of sweet and a lot of flavors. This sauce can be used on practically anything. Keep the temperatures low and let this sauce cook into perfection. Cola is the perfect sweetener for barbecue sauces. The sweet and sharp flavors cook in perfectly, and the caramel adds a great color as it does. This is a classic style barbecue sauce, variations of which date almost as far back as the Coca-Cola does. This sauce will be a definite favorite on any food. The fresh ginger in this barbecue sauce gives it a little lift, while the classic ingredients, which includes a sauteed onion fills it out. Rich and deep in flavor, this barbecue sauce uses ​jerk seasoning to give it some heat while the honey gives it some sweetness. Best of all, the bourbon gives a bite that makes this a fantastic barbecue sauce for any purpose. This tomato-based barbecue sauce leaves out the ketchup and goes with tomato sauce for a richer, deeper flavor. 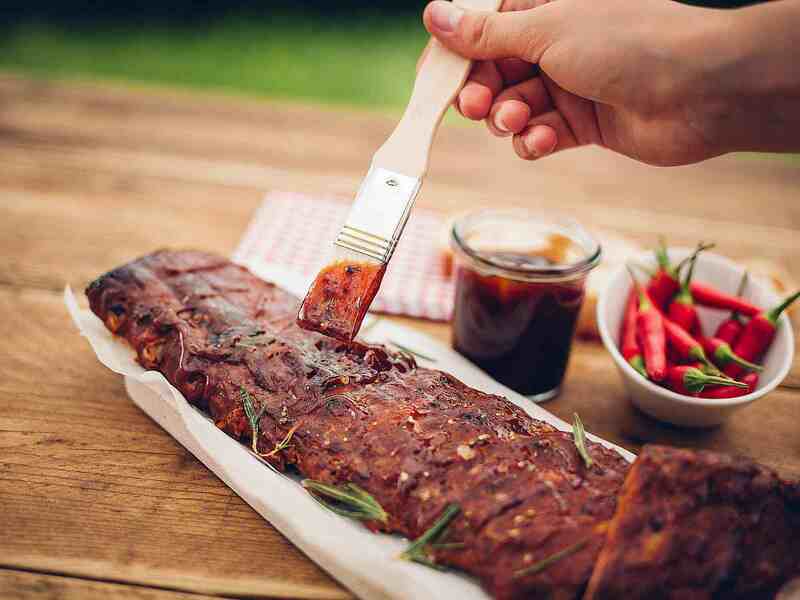 Then it picks up a sweet bite from a good dose of rum and a touch of heat from green chilies—this a great barbecue sauce for most everything from ribs to burgers.